The ANTERO is Pre-cut and designed specifically to fit the Chevy Colorado. 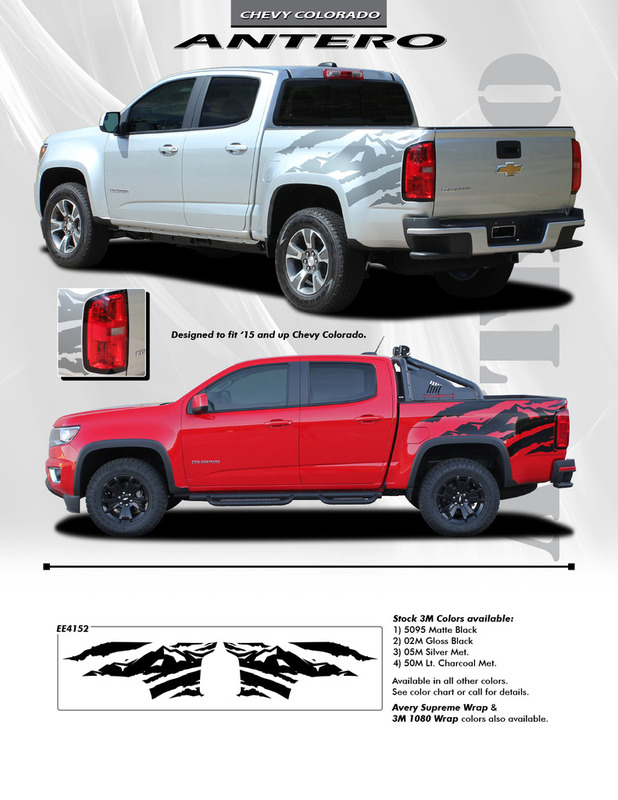 Our Chevy Colorado Bed Vinyl Graphics are guaranteed to add OEM style your 2015 2016 2017 2018 and 2019 Chevy Colorado Pickup truck.The Chevy Colorado Bed Vinyl Graphics kit includes vinyl decals for the driver and passenger sides and each one is precision cut for a perfect fit. The Antero mountain scene stripe is the classic vinyl stripes kit for the Chevy Colorado racing and rally stripes and it adds something special to the classic lines of the Colorado. RaysAutoTrim.com Chevy Colorado and GMC Canyon decals stripe graphics kits are easy to fit and you will usually find that you don’t need to do any trimming at all. We use the same high-grade vinyl and precision cutting techniques that Chevy and GM dealerships do. The only difference you will see between RaysAutoTrim.com vinyl stripe kits and professionally installed Chevy vinyl decals is the price!